Anyone else ever have this particular problem? I'm in the middle of some excellent books right now (Laura Kasischke's The Life Before Her Eyes, Bebe Moore Campbell's 72 Hour Hold, Evelyn Waugh's Decline and Fall) and I can't seem to concentrate on any of them. I pick one of them up, read a page or two, only to discover that I have no interest in reading any further. It's a most frustrating position to be in! Hopefully I'll break free of this reader's block soon and have something more than this pitiful attempt to write in a Sunday Salon. Hope everyone's reading is more productive than mine right now! 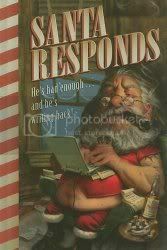 Title: Santa Responds: He's Had Enough... And He's Writing Back! A comical look at what would happen if Santa finally snapped under the pressure and instead of bringing kids the presents that they asked for, instead delivered letters back telling these kids exactly what's on Santa's mind. This is not the milk-drinking, cookie-eating, Coca-Cola-guzzling Santa of our youths (one look at the cover will tell you that!). This is a jaded, blunt, angry Santa who is tired of being under-appreciated over the years. Both the letters from the kids as well as Santa's responses are presented here for your reading pleasure. With the kids letters on the left and Santa's on the right, the reader is given a first hand look at what Santa really thinks about the kids who write to him and about what they think they can get away with asking for. If you are looking for a book that is chockablock with high-class humor, you'll have to move right along passed this one; but if you are looking for something that is just downright funny and in many cases probably considered un-PC, this just might be the book for you. These are the letter Rainer Maria Rilke wrote to the young, aspiring poet Franz Xaver Kappus. Through these letters, Rilke imparts his thoughts and feelings on living your life to its fullest potential, but to also make sure that you stay true to yourself throughout. I read through this book every couple of years, and it never fails to amaze me how a collection of letters written over 90 years ago can still have so much to offer us today. My copy is dog-eared from multiple readings, with numerous passages underlined, but I still seem to find something new in each reading that is relevant to my life right now. I just discovered that Beth Kephart has a blog. Now, who is Beth Kephart, you may ask? To be honest, I don't know of her all that well. What I do know is that her memoir, Into the Tangle of Friendship, has remained with me for years after I read it. Into the Tangle of Friendship is about the strings and threads of friendship that make up our lives. I remember reading it, and how it spoke to me of my friendships at the time. I could relate to so much of the book. I had always meant to read more by her, but as with so much in life, these thoughts got filed away as more and more books were released that I wanted to read. Well, discovering her blog today has rekindled that desire to read more. I've found that in addition to her memoirs, she has also penned several YA books as well. I picked up another memoir not that long ago at a library sale, Ghosts in the Garden, so I think I know what I'll be reading next. If you've never read her, I can't recommend anything beyond Into the Tangle of Friendship, but based on that alone, I would say that she is well worth the reading. She just has a way with words. I don't think you'll be disappointed. The Boston Bibliophile is giving away an ARC copy of Jonathan Carroll's The Ghost in Love. You can learn more here. Today's topic: LT Things - t-shirts, bags, cue cats - are you into the "stuff"? Do you use a cuecat to enter your books, or do you enter them manually? What do you think of the stuff? To be honest, I haven't purchased a thing other than my membership. I often think it'd be fun to get a t-shirt or whatnot, but that's about as far as I get with that idea. All my books have been entered in manually. I've got a lot of books, but I've entered them in lots to LT, so it hasn't been too bad. This was just a plain fun little book to read. What would happen if letters of the alphabet were systematically forbidden to be used? What would you do? This book answers that question! 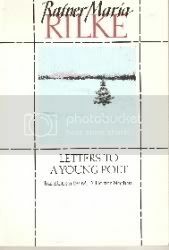 The book is told through correspondence between the people who live on Nollop, and Mark Dunn is genuinely quite clever in how he presents these letters as the Nollopians lose the rights to use one letter after another. I can honestly say that I had a fun time with trying to work out not only the new ways that the Nollopians found to speak, but also the solution to their problem. This wasn't a particularly challenging book to read, but it was a lot of fun and well worth the time. Give it a read sometime if you're looking for something amusing and clever and completely escapist. Star Over Bethlehem is a collection of Christian short stories and poetry.The stories are not deep or really thought-provoking, but they are touching and kind stories. Christie tells some stories from the Bible and then other stories are about how religion can touch a person's life and leave a positive mark. I like that the stories are not preachy in anyway. They are simple tales that tell their story well. A retelling of Howards End, Smith deftly recasts Forster's characters in today's age and sensibilities. Some bits I found a little off (Carlene's bequest to Kiki, for instance, seemed a little out of place) but overall, as a self-proclaimed "homage" to Howards End, Smith created an admirable work. If you are familiar with Forster's Howards End, I think you'll get more from On Beauty. While it doesn't follow the original exactly, Smith does take enough from Howards End that much of her story will make better sense if you've read the other first. It is interesting to see how Smith reworks some of the social structure. 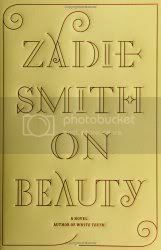 Instead of being a book about social classes and the differences therein, Smith reworked the story to become more a study about liberal versus conservative sensibilities. She still touches on the class differences in several ways, between the students that can't afford to attend college, and the Haitian immigrants who are trying to get fair treatment in the US. To be honest however, by the end of the book I really didn't care what happened to the characters one way or the other. I'm not really sure what happened there, but by the last half dozen or so chapters, I lost all interest in what was happening. The book is still incredibly well written, I think I just grew tired of the constant string of lies and deceit that seemed to stream through the Belsey household. There also seemed to be a lot of build up to the eventual confrontation between the two families, and when it did finally happen, it happened quickly and without much fanfare. It seemed like the book was well-paced right up to the end, and then Smith rushed the story to it's conclusion. I'm not sorry that I read the book; I just think I would have enjoyed a little better pacing at the end of the book. I just read this on BBC. I haven't read many of his books, but what I have read I've enjoyed. A sad day for his fans.